Las Vegas, Nevada: where the cash flows just as easily as the dice rolls. Click here to play! Put on your best suit and get down to the high rolling tables, because tonight is going to be a Vegas Party night. Come down to the Vegas floor and play on this 5-reel slot played across 25 pay-lines, where the more coins you play, the more chances you have of winning. Start the night rolling with some Roulette and cocktails before hopping in the limousine and watching the bright lights of Las Vegas. If you manage to find yourself in the enviable position of spinning five Vegas Party logos on any active pay-line you will earn yourself a cool 9,000 times your initial wager. The biggest question you can ask yourself is can you keep winning all night long? Join the Vegas Party tonight and leave Sin City with a wallet full of cash! 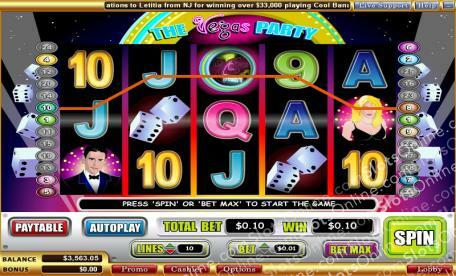 The Car symbol is scatterd in Vegas Party and will earn you 15 free spins when three appear, as well as the payout. The Vegas Party symbol can be substituted for any other symbol in the game expect the Scatter. It also pays out up to 9000 to 1.